With every new race, runners add more race medals to their collection. If I hadn’t injured my foot in the beginning of the year, or injured my knee shortly afterward, I would have added three more medals to my collection. Next week, with the Rock and Roll San Diego half marathon, I would have added four medals to my collection. But, this post is not about dwelling on raced I’ve missed. It is about celebrating races I’ve completed and deciding how to store my growing collection of marathon and half marathon medals. Currently, I keep them in a little plastic shoe box in the downstairs closet. This simply, is no longer acceptable. This is how I currently store my race medals. They are just hidden away in this plastic shoe box. 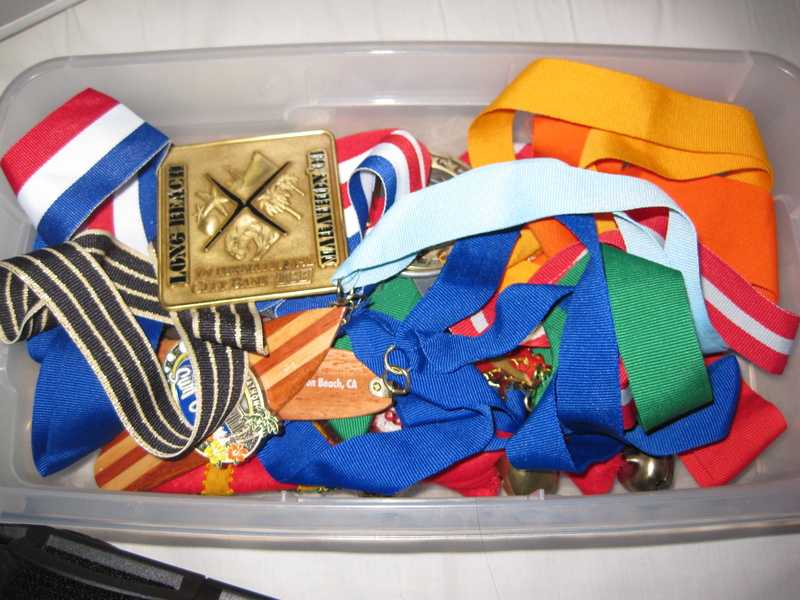 I went through my plastic shoe box filled with medals and I tried to organize it. For now, this will be as good as it gets. I already shared with you how I store all of my race bibs: https://christinaruns.wordpress.com/2010/01/25/running-scrapbook/. I keep them in an “All the Places You Will Run” themed scrapbook along with picture, D-Tags, wristbands, and other race related trinkets I collect. Now, I need to find a way to display my medals with pride. 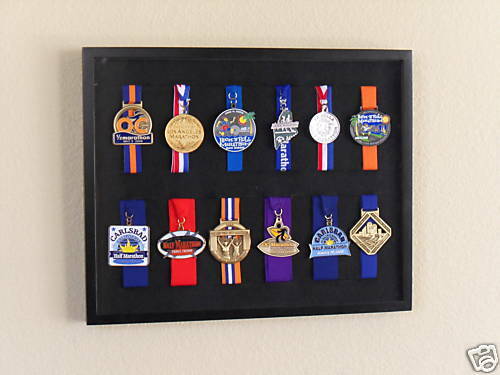 After looking at various marathon medal display cases and racks, I decided that I want to store them in a large shadow box, with the ribbons neatly folded behind the medals. I probably will not get around to this project soon, but I am looking forward to the end result. Below, I posted some examples of what I have in mind for my medals. 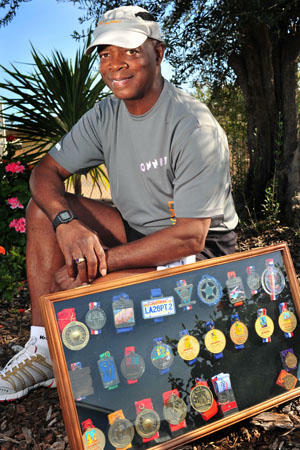 This is Lonnie J. Harris, a legacy runner for the LA Marathon. This is how he displays all of his LA Marathon medals. I love it! This is what I will try to accomplish with all of my medals. I know a display like this will be a great addition to my home office. 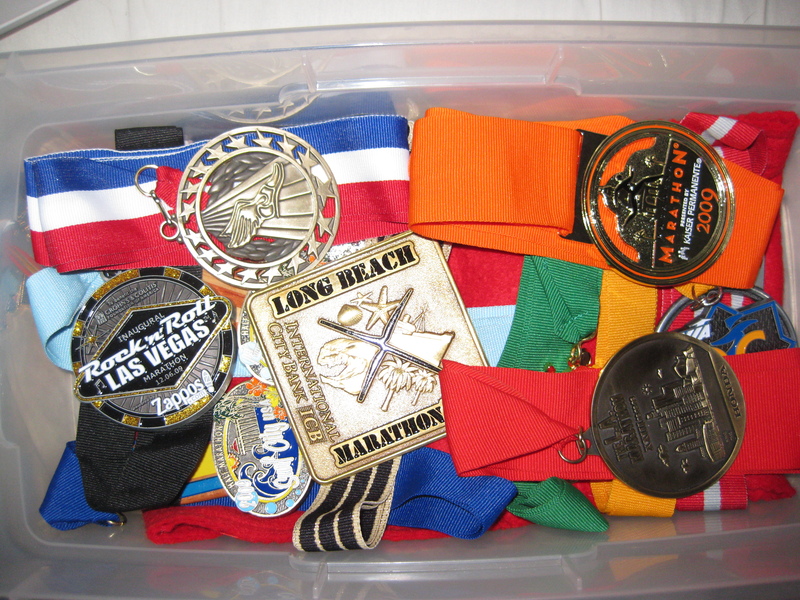 How do you store your medals, bibs, and other race memorabilia? This entry was posted in Race Swag. Bookmark the permalink. At this point I only have one medal, although I have been wondering what to do with it. Someday I hope to have enough to make a shadow box like that! I remember a time when I had just one medal too! They add up before you know it! Have fun with that project! I hardly ever look at my medals and they just hang on a door knob so I will probably be donating a majority of them soon. Thanks for sharing that! I looked up the organization and it is pretty neat. I bought two of these: http://www.containerstore.com/shop/hooks/wallMounted?productId=10005132&N=69019 and I’ve hung about 22 medals on them so far. They don’t look too bad and they accentuate the most recent ones you’ve done. I’m planning on buying a few more hooks to have for when I need them. I like those ones! They are nice, too.